Definition: A complete binary tree where every node has a key more extreme (greater or less) than or equal to the key of its parent. complete binary tree, heap, k-ary heap with k=2. build-heap, heapify, heapsort, priority queue. See also Fibonacci heap, binomial heap. Note: Insertion is O(log2 n) where n is the number of nodes. A binary heap can be efficiently implemented as an array, where a node at index i has children at indexes 2i and 2i+1 and a parent at index i/2, with 1-based indexing. If a child index is greater than the number of nodes, the child does not exist. The above implementation is inefficient with virtual memories because (almost) every level is in a different page. B-heaps allocate subtrees to a single page for better virtual memory performance. Merging two binary heaps is O(n): the best you can do is just concatenate two heap arrays and make a heap of the result. Two binomial heaps can be merged in O(ln n). Two Fibonacci heaps can be merged in Θ(1). delete (C) and insert (C and Pascal) both of which use the auxiliary function siftup (C and Pascal), explanation, examples, and code (C). (Fortran). "... you just KNOW Billy's going to open the root present first, and then everyone will have to wait while the heap is rebuilt." 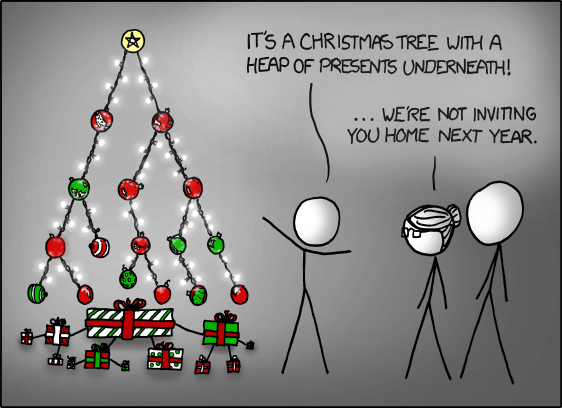 From xkcd 835 by Randall Munroe. Creative Commons Attribution-NonCommercial 2.5 License.